Borrower : Thompson Entertainment, Inc.
GamerBus is a popular gaming bus filled with video gaming equipment traversing the Hampton Roads region, bringing big titles like Fortnite, Madden, and Super Smash Bros. to birthday parties and other special events. 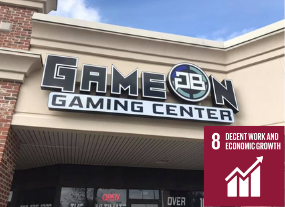 During the past five years, GamerBus has proven out its business model of bringing boys, girls, and adults together over video games and fun, so the company decided to expand to a storefront in Virginia Beach with the GameOn Gaming Center. GamerBus and GameOn are subsidiaries of Thompson Entertainment, owned by Daniel Thompson and managed by his wife, Deidre. The popularity of the bus – which hosts more than 400 events each year – forced the Thompsons to turn groups away due to overbooking, but the GameOn storefront has allowed them to hold more parties and people. GameOn chose a high visibility location in an area with ample parking; it is also neighbors with a movie theater, restaurants, and other retail establishments at the Kemps River Shopping Center. The area is also fitting for GameOn’s “Parents’ Night Out” events, which allow parents to drop their kids while they go out for date night. VCC’s $68,000 loan, backed by the Small Business Administration, was used for video game equipment and the buildout of the storefront at 5300 Kemps River Dr., which opened last year. GamerBus is the only provider of mobile video game parties within a 100-plus mile radius of their Chesapeake home office, with the closest competitor being in Richmond. The video game industry has been growing since the 1980s and shows no signs of slowing down. Thompson Entertainment’s goal is to make a splash in the gaming technology market, as well as to add additional revenue by joining the online gaming world – two fields that remain largely untapped in the Hampton Roads area. While GamerBus and GameOn are not major job-creators, they do tap into a key part of VCC’s mission of creating vibrant communities. Games like these are more enjoyable in groups, and the company is bringing people together in the Hampton Roads area through its small business. The Thompsons are also providing a safe place for children to spend time together and build relationships. The Thompsons’ loan is classified as a Small Business Administration (SBA) 7(a) loan, a popular loan program that helps small businesses obtain financing by offering lenders a guarantee on default. SBA loans like these give lenders such as VCC added reassurance, and in turn, help early-stage entrepreneurs like the Thompsons to get off the ground. VCC is an SBA-Preferred Lending Partner and therefore has the option to use its authority to expedite the approval process for these federally backed loans. Our Loan Officers are trained in SBA eligibility and can save time upfront on structuring the best option for borrowers such as Thompson Entertainment. For these reasons, VCC has become a top SBA lender in Virginia. VCC’s staff also has expertise in USDA and other loan-guarantee programs. Learn more about Small Business Lending.